Douglas Fairbanks rose from obscurity to become one of the most famous people on earth during the silent era. His early light comedies are mostly forgotton today, but his epics from the later silent period have assured Fairbanks a lasting place in the minds of all who see them. Born into a bizarre family situation, Doug's father abandoned the family when he was five. Mother Ella raised Doug, his brother and several half-brothers by herself in Denver. Excelling in theatre and high-spirited antics, he quit school in 1899 at the age of 15, whereupon he picked up a gig touring with Frederick Warde's troupe, as both actor and assistant stage manager. Lighting out for the Bigtime, young Fairbanks was determinded to make it on the Great White Way. Working at odd jobs, he finally landed his first role in 1902. The personalble and funny young fellow was on the Broadway stage almost coninuously from 1902 to 1915; Fairbanks was too young to play leading roles in comedies or melodramas, but he was in the cast as the son, the best friend, the office guy. In 1907, Fairbanks had married Anna Beth Sully, with whom he had a son, actor Douglas Fairbanks, Jr. 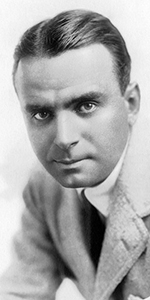 The family moved to Los Angeles in 1915, where Doug found work with D. W. Griffith at Triangle Pictures. Fairbanks was an immediate sensation, becoming a hugely compensated star. As the United States entered World War I, Fairbanks and his new gal pal Mary Pickford, along with Charles Chaplin, toured the U.S. selling War Bonds, which raised millions of dollars for the war effort. As the feature film format solidified, Fairbanks, Pickford, Chaplin, and Griffith wanted to call their own shots on their films. Pooling their talents together in 1919, they formed a company they called United Artists. Fairbanks' films made an early contribution to the success of the company. Fairbanks and Pickford married in 1920; they were considered the height of Hollywood royalty — it was impossible to imagine a more glamorous couple. Beginning with The Mark of Zorro (released in December 1920), Fairbanks combined the pleasures of the costume picture with his own madcap sense of fun, yielding a smash hit for UA. This idea was repeated in his version of The Three Musketeers (released in August, 1921, Douglas Fairbanks in Robin Hood (released in October, 1922, The Thief of Bagdad (released in March, 1924), The Black Pirate (released in March, 1926) and The Gaucho (which played the Chinese in November, 1927). Speaking of the Chinese, Fairbanks and Pickford were great friends with Sid Grauman. It is not for nothing that they became the first pair of celebrities to be imprinted in his forecourt: they had invested in the joint! All three were part of the newly organized Academy of Motion Picture Arts and Sciences, with Doug becoming its first president. It is said that Fairbanks was not crazy about working on sound films, due to the additional time required to record them. But besides that, his health was fading. He and Mary had made a talkie of The Taming of the Shrew (released in November, 1929), but it did not perform well. He retired from the screen in 1934, followed by a divorce from Pickford in 1936. Fairbanks married Sylvia, Lady Ashley, with whom he traveled a great deal. Fairbanks suffered a fatal heart attack at his home in Santa Monica in 1939, at the age of 56. Grauman's Chinese Theatre, Hollywood, California. Douglas Fairbanks footprint block. Executed by Jean Klossner, Saturday, April 30, 1927. 48 x 42 inches. Grauman's Chinese Theatre, Hollywood, California. Douglas Fairbanks/ Mary Pickford Forecourt ceremony, Saturday, April 30, 1927. 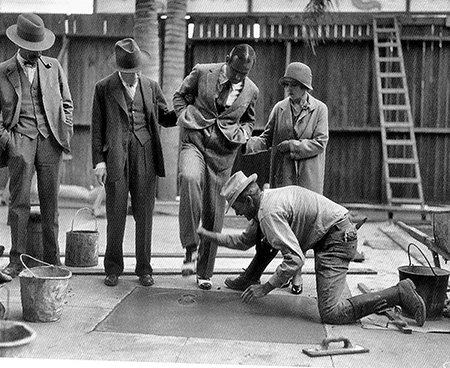 Two unidentified men watch as Fairbanks is imprinted by cement artist Jean Klossner. Mary Pickford holds Fairbanks steady.